At The Eternity Rose, we grow our own roses to produce flawless gold, platinum, silver and glazed flowers for our customers. Our team of experts are trained horticulturalists who know how to grow the best quality roses. We use the Rosa X Centofolia rose variety for all our roses. This complex hybrid rose variety contains R eternity, R rubra, R caninae and R moschata. Our roses are judiciously taken care of, and when they begin the process of opening up, they are gently picked to meet our high standards. The process begins immediately so that they remain at the height of their splendour. The process begins when the rose is covered with a translucent coating, so that its famous shape remains during electroplating. This technical process keeps the flowers frozen in their impeccably natural shape. Once this step is completed, the flowers have to go through a bevy of steps to equip them with multiple layers through immersion electroplating. 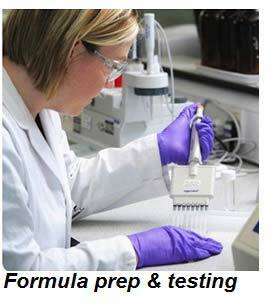 Using our proprietary processes and formulae, we are able to complete the immersion. First and foremost, the roses are electroplated with a multitude of copper layers to deliver a texture-sensitive and thoroughly precise layer, while also providing a robust precious metal plating brace. Once the rose is carefully sealed and layers of copper are introduced, we begin the process of nickel electroplating. This step is important because it holds the flower structure in place for the last step of plating in a precious metal. Once each layer is complete, every rose is judiciously inspected for plating quality, form, and other potential blemishes that might occur during the electroplating process. 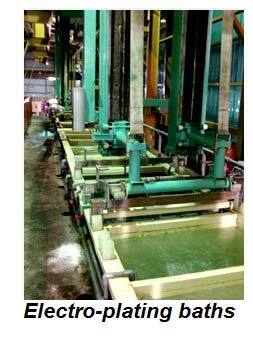 When each rose passes our stringent quality control testing methods, it is placed in the silver, gold or platinum electroplating baths. This process consists of dozens of thin layers. The gradual process means the layers are accumulated over weeks for a perfect lustrous finish. We assure you that these flowers will not corrode, and can last for a myriad of generations. The entire process takes about three months for each rose. 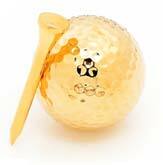 For further information about gold, you can read our section on Various Types of Gold. The simplest and most honest answer is YES! Thousands of companies worldwide will manufacture plastic flowers with gold and silver plating; and believe us, it isn’t that difficult to tell the difference between a metal-plated plastic rose and a real one. 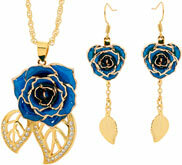 An electroplated real rose still displays its natural bumps, leaf veins, and stem characteristics in detail. And every detail is unique to each rose, as per the uniqueness of a human fingerprint. Thus, each Eternity Rose is a genuine flower. 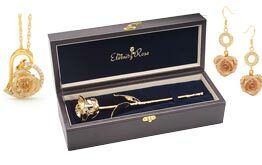 We have seamlessly refined the procedure of electroplating, to layer metal onto flowers, and because of our experience, we deliver only premium quality gold and precious metal-plated natural roses, with no exceptions. In terms of our coloured roses, every flower has several coating layers of our proprietary polymer lacquer composite. These flowers are partially electroplated. Only the flower edges get sheared in precious metals and become robust. 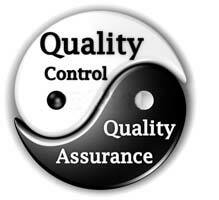 Every consumer must understand our stringent levels of quality control to guarantee quality products. In fact, we can proudly say that people often comment that our real-life products look far more impressive than our promotional photos. The website pictures do not fully capture the striking fine gold finish, or the radiant gleam of the flower’s natural curves. Just touching an Eternity Rose will help you distinguish between the beauty of natural flowers and artificial flowers. We are so careful with our quality that you will notice it in our world-class craftsmanship and perfect finishes. Envision a striking rose enveloped in a bed of glossy gold or sparkling silver; that’s the beautiful Eternity Rose for you. We urge you to get your silver rose polished every year to sustain its sparkle; like normal silver, it starts to look dull in time. The Eternity Rose platinum or white gold roses have a darker sheen than silver, so you’ll easily be able to tell the difference. 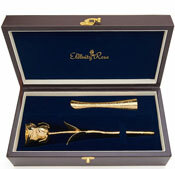 They make invaluable gifts for people who appreciate the idea of beautiful precious metals. Many of our customers like to choose a blend of gold and platinum or silver to create striking posies that can be used on multiple occasions. We have slowly perfected our process over the years. We consider every step to be a learning curve, and we strive hard to deliver the best money can buy. That’s why we are entrusted with delivering official gifts to royals and dignitaries across the world. While we have encountered several imitations of the ‘Eternity Rose’ over many years, we can proudly say that none have been able to match the quality, look and finish of our products. This type of intricate care is what makes us the preferred partner when it comes to choosing an Eternity Rose. 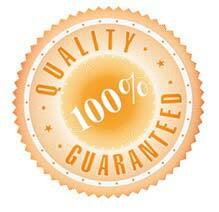 In fact, we feel so confident you will love our products, that we offer all our customers a 90-day money-return guarantee. If you don’t like what we offer, we’ll refund you in full. To date, we have only had to offer a small handful of refunds back to our customers, despite the incredible sales volumes we have accomplished. This is testament to the high quality standard of our products. Despite their delicate appearance, you’ll find that an Eternity Rose is structurally strong and robust, because of its nickel layer. An Eternity Rose will not easily break unless you apply a tremendous amount of pressure on it. Normal handling is unlikely to damage the roses in any capacity. Even if you drop them onto a carpet, they will unlikely break or dent, but that doesn’t mean you should try. If they fall on hard surfaces, they may suffer from surface scarring, but they won’t break. 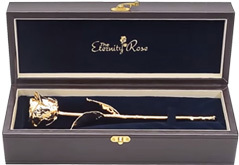 At The Eternity Rose, we are dedicated to delivering only the best quality products, and we follow the strictest quality control checks to ensure that every released product meets the highest of standards.